L had came up to KL for her internship and so it only means two things, bad news is there would not be any Penang food reviews BUT the good news is there would be more PJ/KL food review, by us of course! Well today we manage to meet up for dinner and L had a sudden craving for pizza, yes this dear friend of mine always have cravings of some sorts at some time. 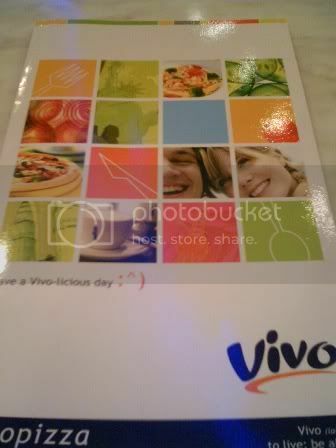 So we head on to Vivo at The Curve, which we had a celebration last month for one of the 1984, which got us to remember the pizza offerings there. 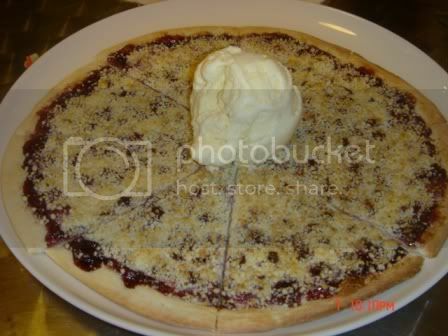 Besides, we remembered the nice lady boss, who when learnt of my friend’s birthday, gave us a complimentary Blueberry Pizza served a dollop of vanilla ice-cream. It was really thoughtful of her, and very good customer relationship management I might say. 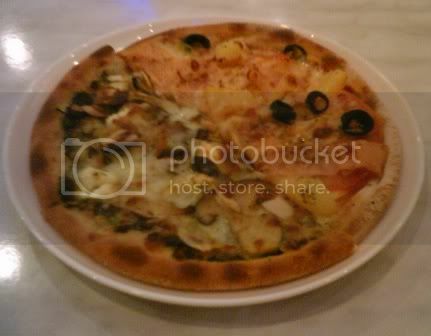 They had this set promotion for one person, which is a personal pizza with mushroom soup for RM 9.90. Seems like a good deal so L and I each ordered one, so that we can try two types of pizza. L ordered the Bed of Mushrooms (on the left in the picture) which was really nice. It was topped with various mushrooms, some black herbs (we cannot seem to identify it but it was good), crumbled feta cheese, splashes of olive oil and a very surprising but wonderful addition which is almond flakes. We both agreed it was exotically good. As for me, I ordered Romeo and Juliet (right) which was pizza topped with turkey ham, tomatoes, pineapples and olives, not too bad but it was overshadowed by the earlier one. Overall, the pizza base was good, thin enough to be crunchy yet still with some chew. 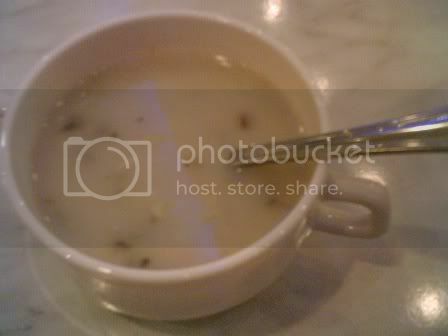 As for the mushroom soup, it was good enough for us, slightly creamy and flavourful, certainly not like some other pizza outlets which are those like out of the can and watered down. There is some collection of cakes at the dessert section, but I have yet to try that, but the earlier mentioned Blueberry Pizza was good. This picture was taken by the birthday girl during our last visit. Do give it a try if once you are in The Curve and have nothing to eat. But to my humble opinion, other than the pizza, the other various foods were just so-so. Yeah, I tend to give this place a miss too as I heard food is also so so. i have yet to find anything nice to eat in the curve, although it was first fame for having 30+ of food outlets. funny i was there at Vivo's on the same day! in the evening though. chicken chop and baked fish. yummo! Rachel is enjoying life, hunting for makan now. leisha, thanks! do come back for more! tazz, i know what you mean :P i will be cooking soon, as soon as i settle down with my life.